On this fine day, I'm day dreaming of all things musical. It's incredibly quiet in here now (Bunny bee is taking a nap) and this illustration on my wall looks like the most appealing thing ever. I first read this 'sing from your heart' phrase on a Yogi tea bag (they have these inspiring messages - a unique one with every tea bag) and drew the illustration as a reminder to sing my heart out (in the privacy of home, when I'm alone) and not worry if I got the tune wrong. It is truly liberating. What about you? Do you need a reminder to sing from your heart too? I hope your day is amazing in every way! 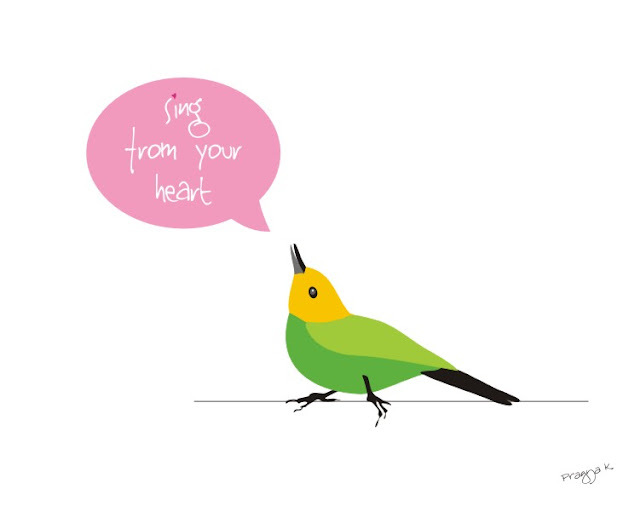 Sing from your heart, available for purchase here. Hello there! I'm Pragya, a New Jersey based illustrator. I express my love, concerns and thrills through colorful and whimsical illustrations. yes i certainly need to put that on my wall! haha im afraid im so out of tune when i sing. So i have to be reminded of that. Like so what? haha thanks beautiful illustration! Art that makes you happy! INTERESTED IN A CUSTOM PORTRAIT OF YOUR FAMILY, HOME, PET OR FAVORITE THINGS? All images are copyright of Pragya Kothari. Simple theme. Powered by Blogger.